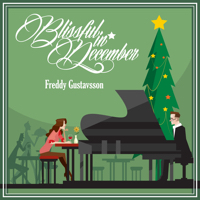 My debut album “Blissful in December” (release date October 15) will be available as a CD record and for digital download. The physical CD record comes in a green shrink-wrapped cover and will be sold primarily at cdbaby.com. I also have a number of records at home, so if you are interested in getting one, please contact me after the release. In addition, the album will be available for streaming and purchasing at most major online music services and retailers, such as Spotify, Apple iTunes, Google Play, Amazon, YouTube, SoundExchange and Pandora. Amazon has already published a preview of the album, including the possibility to listen to samples of each song and pre-order the album. Please note that Amazon only offers digital downloads in MP3 format. For those of you who subscribe to Spotify or other services, you will be able to access the songs through those services without any additional costs. In the next journal entry I will tell you more about how the album was produced.